With BlogVault you can Auto-Restore or Migrate your Backup at any time. Both processes are executed by doing the same steps that's why we're covering them in one tutorial. If your site breaks or you want to revert to a Backup then using BlogVault and the Auto-Restore options can be very helpful. Start by logging into your BlogVault dashboard and clicking on the Auto-Restore or Migrate-Site link to the right of your backed up website. In the first step you will be asked about the sFTP credentials of your Themeco hosted website. 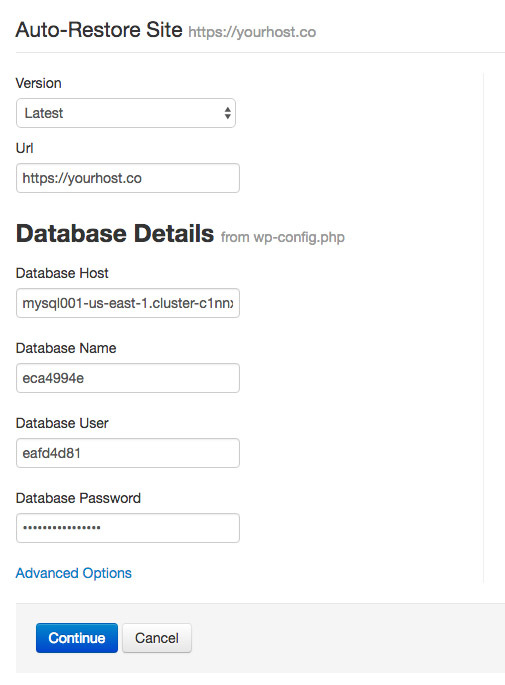 You can gather them in your Themeco hosting dashboard by clicking the sFTP button next to your site url. After entering the credentials you will be asked to select the folder / root directory of your installation. Click on the public/ folder since that's your root installation folder and press continue once you've done so. BlogVault will now fetch the database credentials and the only thing that needs to be double checked is the Url value. If you do a Auto-Restore the Url will already be prepopulated but when doing a migration you need to enter the Url of the server you are migrating to as BlogVault replaces all urls with your new url when doing a migration. Once that's done the restore or migration will start. Keep in mind that this process is automatic so you can close the window and it still will process in the background and you will receive an email once it's done.